If you thought Bodia Spa was one of the best that Cambodia has to offer, you are mistaken. I have been to Bodia Spa in Siem Reap but after I experienced this ’78 USD for 2 hours’ package at ‘The Spa’ at NagaWorld Phnom Penh, Bodia Spa of Cambodia is looking to me like a fraud establishment. At Bodia I spent a little under 50 USD for a 90 minute Aromatherapy and got a mediocre massage in not so special surroundings. At NagaWorld, spending 78 USD got me 2 hours of total pampering – 30 minutes of sea salt body scrub and one hour of Aroma therapy massage in a private 5-Star suite that not just had a massage table but a comfortable double bed, a sauna cabin, a steam cabin, a jacuzzi and a shower. The remaining 30 minutes when I was not getting a scrub or a massage, I was at liberty to use the various facilities in the suite. If you have not had this experience at The Spa, reading this article will surely make you wanna do it during your next visit to Phnom Penh. ‘The Spa’ is located inside NagaWorld Hotel and Entertainment Complex in Phnom Penh and is open 24 hours a day. It is located a 2-USD tuk tuk ride away from the Phnom Penh river front. Usually an advance reservation for a session at The Spa would be preferable, but I assume they do not get very busy and one can just walk in at any time of the day or night. Actually there is an advantage of making an advance reservation here. The Spa has masseuses from at least three different nationalities – Cambodian, Chinese, and Vietnamese. If you make an advance reservation, you may get to choose the nationality of the lady who will give you the massage. If you walk-in, still you may get to choose but most likely they will have only Cambodian staff available. The reason is that Vietnamese and Chinese masseuses are more popular with the clientele here. To make a reservation, you may call NagaWorld at +855 23 22 88 22 and ask for The Spa. 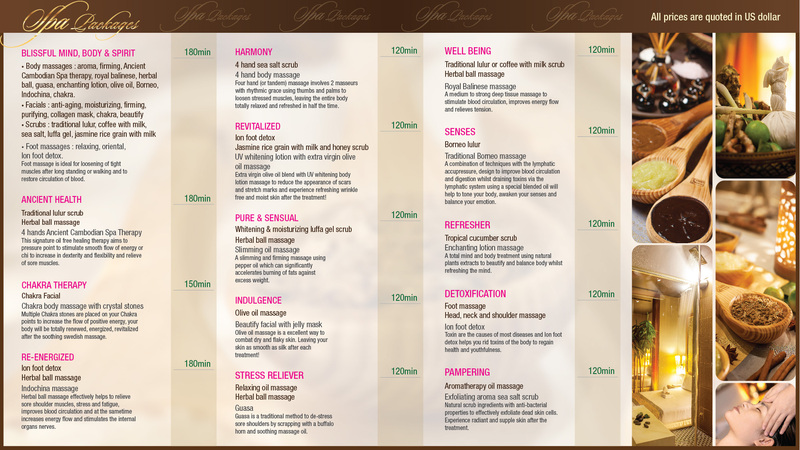 The Spa has many massage & body scrub packages that can be seen from this online menu here. The prices are between 78 and 118 USD for most packages. However, their 78 USD 120 Minute ‘Pampering’ package is real value for money and is one of the least priced packages. Pampering includes a sea salt body scrub followed by an Aromatherapy massage. Payment can be made with credit/debit cards or in cash at the front desk. After making payment at the front desk, the hostess will lead you to your private suite and will ask you to change into their bathrobe while you wait for the masseuse to arrive. Within 5 minutes, the masseuse arrives and the session begins. Disposable underwear is provided if the customer asks for it. The body scrub is done on the massage table that you see on the left side in the above picture. After 20-25 minutes of the scrub, the masseuse will ask you to spend a few minutes inside a sauna or a steam cabin. Then a quick shower and you are ready for the body massage to begin. The Aromatherapy or any other body massage is done on the comfortable double bed. After the massage you may take another shower if you like but they use some very good quality gels for the massage and a shower after the massage may not be such a good idea. But it is up to you. The total package is for 120 minutes but in my experience the total scrub & massage time is about 75 minutes and the rest is spent in the shower / steam, getting ready afterwards, etc. They also have 180 minute packages and I am sure those offer great value too. The masseuses are well trained and are very courteous. The Private suite deserves all praise. It is better than an average 5-Star hotel room. Apart from the steam/sauna/jacuzzi, the toiletries provided are of super quality. If you are staying at Hotel NagaWorld, then you can have any body massage by a masseuse of The Spa in the comfort and privacy of your own hotel room. There is no extra charge for in-room massage. I think they do not offer a body scrub in hotel rooms but all massage therapies are available for in-room service. At The Encore Wynn Macau you will get a similar private suite and a similar 2 hour package at a price of around 2500 HKD, that is over four times of the price charged by The Spa at NagaWorld. In other words, at The Spa at NagaWorld you can have this experience four times for the price that you pay for one session at Wynn Macau. Just remember that the 2 hour package at The Spa does not mean two hours of massage. Like I said earlier the actual scrub/massage time is about 75 minutes and if you keep this in mind, you will not get disappointed.